Status Quo fans are having a year to remember. Hot on the heels of shows by the reunited classic line-up of Francis Rossi, Rick Parfitt, Alan Lancaster and John Coghlan, there is news of a new album and tour by the current incarnation of the band, Rossi, Parfitt, Rhino Edwards, Andy Bown and a yet to be announced drummer. Rossi and Parfitt will also appear on the big screen in the comedy drama movie Bula Quo which opens in cinemas nationwide on July 5. 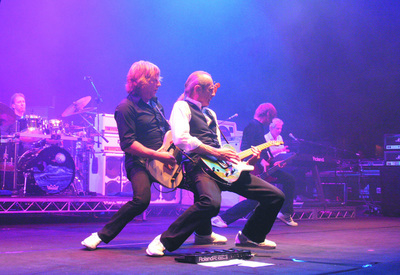 Songs from the film, a mix of new tracks and versions of Quo classics, will be released on a double album on June 10. The tour, which begins on December 6 at Liverpool Echo Arena and concludes at Newcastle Arena on December 19, is also dubbed Bula Quo and has 10cc as special guests. Frontman Francis Rossi recalls that even though the film was made on location in Fiji it almost felt like having a proper job. ''We were up at five most mornings, left at six, on the set at seven, and we didn't clear till around 6.15 when the sun went down. It was like proper work, I was falling asleep at half past eight at night. We did three weeks like that, then we did nights, working 6pm till 6am. Francis says that he and band member Rick, whose previous acting experience was appearing in episodes of Coronation Street, play themselves in the film. As you would expect, the movie features plenty of music. He adds that the soundtrack is very diverse, as opposed to the band's last studio album, Quid Pro Quo, which, he claims, features songs with similar BPM - Beats Per Minute - and in similar keys. CD1 - Looking For Caroline/ Go Go Go/ Run and Hide (The Gun Song)/ Running Inside My Head/ Mystery Island/ All That Money/ Never Leave A Friend Behind/ Fiji Time/ Bula Bula Quo (Kua Ni Lega). CD2 – Living On An Island (Fiji Style)/ Frozen Hero/ Reality Cheque/ Rockin' All Over The World/ Caroline (live)/ Beginning Of The End (live)/ Don't Drive My Car (live)/ Pictures Of Matchstick Men (live)/ Whatever You Want (live)/ Down Down (live). Liverpool Echo Arena (6); Birmingham LG Arena (7); Cardiff Motorpoint Arena (8); Plymouth Pavilions (10); Bournemouth BIC (11); Brighton Centre (13); Nottingham Arena (14); London O2 Arena (15); Leeds Arena (17); Glasgow Hydro (18); Newcastle Arena (19).